1. Millennials will inevitably be better off if they use a trendy robo-adviser or app to save and invest. 2. No financial adviser would ever touch them and their pitifully small pots. 3. The charges differential between robo-advice and face-to-face is huge. 4. Robo-advisers are fairer value than full advice processes for younger clients. To start, I am not, in principle, against the idea of robo-advice. I am certainly not against the idea of self-directed investing more generally. 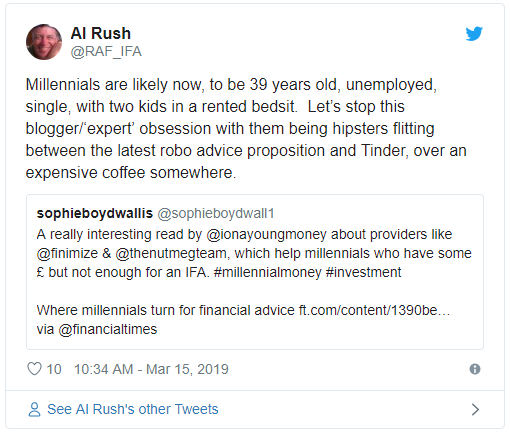 But I do have an issue with what is under the bonnet of many of the current crop of robo-advisers and whether every milennial really should be jumping on the bandwagon. Let’s take Nutmeg as an example (simply because it got there first and has the highest profile, not because the issues mentioned are unique to its model). Describing Nutmeg’s environmental, social and governance credentials as “woke” – as one columnist did earlier today – has just alienated a whole bunch of milennials like me who are tired of financial services brands attempting to appear relatable – or worse, cool. We just want brands we can trust to give us a good deal. Before successive rounds of charging cuts, Nutmeg charged 1 per cent for its lowest value portfolios. 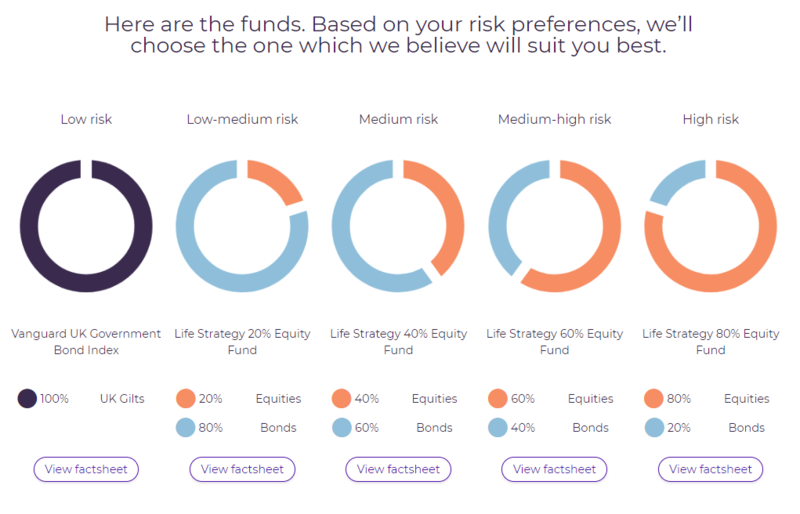 Taking the current pricing on its fixed allocation portfolio (which has no active management) as an example, for, say £5,000 of investment – a not atypically millennial pot – Nutmeg’s charge is 0.45 per cent, to which average fund costs of 0.18 per cent and 0.08 per cent for market spread effects are added. To put it bluntly, there are cheaper places to buy a stocks and share Isa and cheaper ways to buy passive exposure to market growth. The distinction between fund, advice, and platform fees is completely alien to the first-time investors and young people we need to encourage to save more, I grant you that. But when we completely fail to make the distinction between what “advice”, “guidance”, and investment offerings each service actually provides, and for what price, we run the risk of blindly encouraging millennials to put their money into inferior solutions when there could be far better options out there. Moving to a lowest common denominator approach where we just lump one aggregate cost figure in because we can’t trust young people to understand nuance does milennials a massive disservice. We need say more than the commentator did, which was just to say that an initial quote for advice for a young person was “5 per cent of the total value of my investments” . Five per cent, up front, as solely an advice fee, would be ridiculous. It’s nowhere near the average. 3 per cent up front, which you then don’t pay after year one, is not. Paying fund, platform charges, and an ongoing advice charge of, say 0.5 per cent, could then come to pretty much the same as some of the more expensive robos on the market, and you get advice to boot. I trust millennials to get that. It might sound like splitting hairs, but we belittle the intelligence of milennials when we say they can’t make many of these decisions themselves while they still have relatively modest pots. Yes, £350 for Nutmeg’s “advice” may not sound like a lot. But that “advice” only tells you which of Nutmeg’s portfolios you should be in. Chances are, its a waste of a valuable £350 that could be put into something like the Vanguard LifeStrategy range for much cheaper product fees. It’s not Nutmeg, but I’ve just seen an account valuation from a personal finance app. The client has around £400 in an Isa. 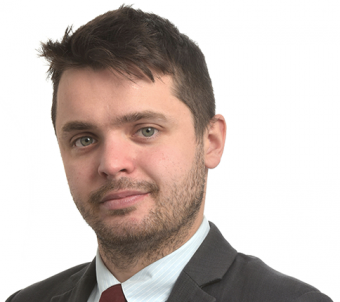 There is a 35 per cent allocation to property – the risk of which really needs to be justified. There’s also a 60 per cent allocation to Vanguard. In that case, you’re just paying for the middle man. Anyway, if the 10-15 simple questions that most robos have to allocate you to a basket of investments don’t get you to the right portfolio without the introduction of an advice element, we should be pretty concerned about the entire process. That, or the investment range offered is too complex and should only be put in the hands of advisers, not self-directed investors. You can’t charge for the benefit of “advice” and not offer anything that has much more substantive value the peace of mind, but I fear that is how many digital wealth managers are pitching themselves as they attempt to move from the guidance market to financial planning targeted at the younger generation. The jazzier the marketing, the quirkier the gimmicks, the more outgoings the robo or app will have. Come back to me in 10 years and we’ll see how many youngsters who were told over and over again they had to get involved with these companies lose trust in investment management for good because the company has collapsed after failing to make a profit. We fetishize smartphone investment managers in exactly the same way as we fetishize all start-ups. They are exciting and shiny, but they are untested, and could just as easily fall foul of bad decision making as the next hip new tech firm, and commentators aren’t encouraging millennials to put their money in venture capital. Regardless, I don’t have the answers of where to start on my own finances, and I get paid to live and breath the industry, so I’d quite like to go and see someone, thanks. If you actually asked young(ish) people like me, they would say they are starting to think twice about trusting digital solutions in an era of hacking, phishing and scamming all after our financial lives. A millennial in their early to mid-30s might have more complex needs than someone nearer retirement. They might need help getting on to the housing ladder, rather than just paying off the same mortgage they have had for years, or not having one at all anymore. They are more likely to be self-employed, have had multiple jobs with multiple pensions, be thinking about how to afford to start a family, or look after their ageing parents. Those circumstances need proper advice, not just trite statements about how they should have saved more if they wanted to obtain it. Plenty of “traditional” advisers really do get this and are willing to take on loss-leaders or work at minimal profit safe in the knowledge they have secured a client relationship for life. Sadly, that is often overlooked.